Rittenhouse Archives and www.scifihobby.com are pleased to announce the upcoming release of The Complete LOST IN SPACE Trading Cards, available July 1005. This all-new series will cover all 83 episodes of this classic science fiction show from the 1960s, and features more than 500 all-new photos that have never before been printed on trading cards. Each box is guaranteed to contain 2 hand-signed autograph cards from all of the show�s remaining stars and many of its key guest stars. "Anyone who is a fan of the original Lost In Space will be overwhelmed by how much this collection has to offer," said Rittenhouse President Steve Charendoff. "It blows away every other Lost In Space card set � check that, every other Lost In Space product, period � ever made before this. There�s simply never been a cards set, a book or anything else that has covered this show in such great detail, with more than 500 new photos from across all 83 original episodes." 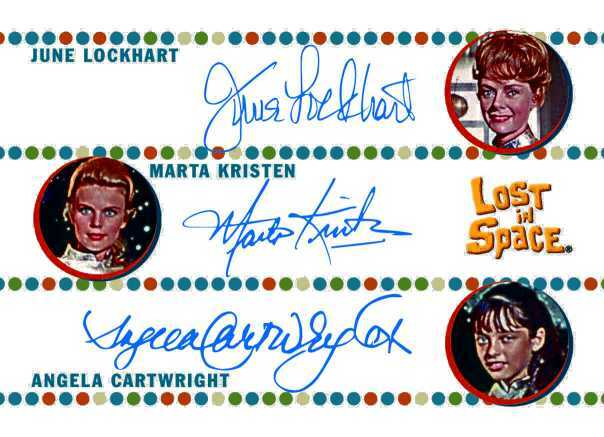 In addition to autograph cards from show stars Billy Mumy (Will Robinson), Marta Kristen (Judy Robinson), Angela Cartwright (Penny Robinson), Mark Goddard (Major Don West) and June Lockhart (Maureen Robinson), this set also features signed cards from key guest stars Dee Hartford (Verda), Vitina Marcus (The Girl from the Green Dimension), Leonard Stone (Farnum), Don Matheson (IDAK), Sheila Allen (Brynhilde, and Irwin Allen�s wife), Daniel J. Travanti (Space Hippie), Francine York (Niolani) and more! As a bonus to dealers and distributors, Rittenhouse has created a cut signature card of the legendary Jonathan Harris (Dr. Zachary Smith) that will be given away free with every 6 cases purchased! Only 50 of these limited edition cards have been produced, making them among the most limited entertainment-themed cards of all-time. 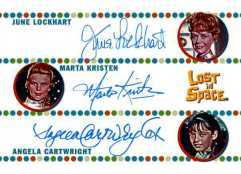 The base set of The Complete LOST IN SPACE Trading Cards will consist of 90 cards, including 1 card for each of the show�s 83 episodes. Every episode card will include 5 different photos and a complete plot synopsis. Bonus card sets that will be randomly inserted into boxes of The Complete LOST IN SPACE Trading Cards will include 55-Card Reprint set of the first Lost In Space cards originally issued in 1966 (1:8 packs); 55-Card Expansion to the Reprint set, with cards numbered 56-110, black & white photos and similar card designs (1:8 packs); 9 "The Good, The Bad & The Ugly" cards (1:8 packs); 9 "Faces of Dr. Smith" cards (1:16 packs); 7 character cards featuring each of the main characters on 3 photos � one from each season the show was on the air (1:20 packs); and 2 SketchaFex� cards of the Jupiter 2 and Space Pod, drawn by artist Cris Bolson. Fans and collectors will also be able to store their collections in a custom designed collector's album, which will retail for $39.99 and will contain an exclusive costume card with material worn in the episode "Fugitives in Space." Rittenhouse Archives, Ltd. is a leading producer of science fiction and fantasy based trading cards and related collectables. Its other licenses include Star Trek, James Bond, Xena: Warrior Princess, Stargate SG-1, Stargate Atlantis, Battlestar Galactica, Farscape, Twilight Zone and Conan.